TEACHER : What is the chemical formula for water? PAPPU : "HIJKLMNO ! "!! PAPPU : Yesterday you said it's H to O ! .PAPPU : Here it is!TEACHER : Correct. Now, class, who discovered America? TEACHER : PAPPU, how do you spell "crocodile"? PAPPU : Maybe it's wrong, but you asked me how I spell it! TEACHER : PAPPU, give me a sentence starting with "I"
TEACHER : No, PAPPU. Always say, "I am." PAPPU : All right... "I am the ninth letter of the alphabet." TEACHER : "Can anybody give an example of " COINCIDENCE? " PAPPU : "Sir, my Mother and Father got married on the same day, same time." TEACHER : "George Washington not only chopped down his father's Cherry tree,but also admitted doing it. 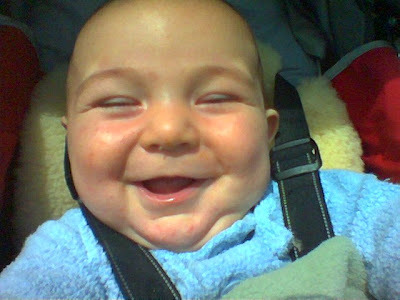 Now do you know why his father didn't punishhim?" TEACHER : What a pair of strange socks you are wearing, one is green and oneis blue with red spots ! PAPPU: Yes it's really strange. I've got another pair just like that athome. PAPPU: No sir, I don't have to , my mom is a good cook. TEACHER : PAPPU, your composition on "My Dog" is exactly the same asyour brother' s. Did you copy his ? PAPPU: No, teacher, it's the same dog ! Manager: Sorry, but I can't give you a job. I don't need much help. Job Applicant: That's all right. In fact I'm just the right person in thiscase. You will see, I won't be of much help anyway!! Diner: I can't eat such a rotten chicken. Call the manager! Diner: You'll drive me to my grave! 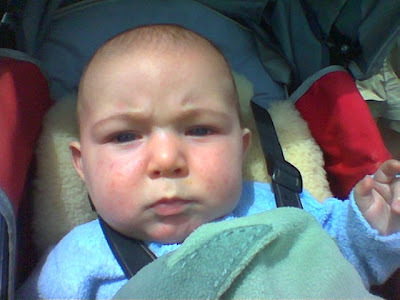 Husband: You know, wife, our son got his brain from me. Wife: I think he did , I still got mine with me! Officer: Don't worry. If no one claims itwithin three days, you can keep it. Father: Your teacher says she finds itImpossible to teach you anything! Son: That's why I say she's nogood! I was driving with my three young children one warm summer evening when awoman in the convertible ahead of us stood up and waved.She was stark naked! As I was reeling from the shock, I heard my5-year-old shout from the back seat, "Mom! That lady isn't wearing a seatbelt!" A little boy got lost at the YMCA and found himself in the women's lockerroom. When he was spotted, the room burst into shrieks, with ladies grabbingtowels and running for cover. The little boy watched in amazement and then asked, "What's the matter,haven't you ever seen a little boy before?" while taking a routine vandalism report at an elementary school; I wasinterrupted by a little girl about 6 years old. Looking up and down at myuniform. She asked, "Are you a cop?" Yes," I answered and continued writing thereport. "My mother said if I ever needed help I should ask the police. Isthat right? "Yes, that's right," I told her. "Well, then," she said as sheextended her foot toward me, "would you please tie my shoe?" It was the end of the day when I parked my police van in front of thestation. As I gathered my equipment. My K-9 partner, Jake, was barking, and I saw a little boy staring in at me"Is that a dog you got back there?" he asked. "It sure is," I replied.Puzzled, the boy looked at me and then towards the back of the van. Finallyhe said," What'd he do?" While working for an organization that delivers lunches to elderlyshut-ins, I used to take my 4-year-old daughter on my afternoon rounds.She was unfailingly intrigued by the various appliances of old age,particularly the canes, walkers and wheelchairs. One day I found her staring at a pair of false teeth soaking in a glass.As I braced myself for the inevitable barrage of questions, she merelyturned and whispered, "The tooth fairy will never believe this!" A little girl was watching her parents dress for a party. When she saw herdad donning his tuxedo, she warned, "Daddy, you shouldn't wear that suit." "And why not, darling?" "You know that it always gives you a headache thenext morning." While walking along the sidewalk in front of his church, our minister heardthe intoning of a prayer that nearly made his collar wilt. Apparently,his 5-year-old son and his playmates had found a dead robin.Feeling that proper burial should be performed, they had secured a smallbox and cotton batting, then dug a hole and made ready for the disposal ofthe deceased. The minister's son was chosen to say the appropriate prayersand with sonorous dignity intoned his version of what he thought hisfather always said: "Glory be unto the Faaaather, and unto the Sonnn, andinto the hole he gooooes." A little girl had just finished her first week of school. "I'm justwasting my time," she said to her mother .. "I can't read, I can't writeand they won't let me talk!" A few days ago I watched a wonderful movie based on a true story : “A bear named Winni”. I was moved by the story, and when the movie ended up there were just tears , although it is not a sad ending somehow , but still , it is a story that touches the heart. I recommend this movie to any one who cares about animals , hope , friendship . Captain Harry Colebourn was born in 1887 in Birmingham, England and moved to Canada in 1905. He trained at the Ontario Veterinary College in Toronto, graduating with a Bachelor of Veterinary Science in 1911. • After graduation Colebourn took a job with the Manitoba Department of Agriculture in Winnipeg. He trained with the militia in his spare time and became a provisional lieutenant in the Veterinary Corps. With the start of the First World War in August 1914, Colebourn became a member of the Canadian Army Veterinary Corps. The Corps' duty was to care for the thousands of horses the army used to transport artillery, supplies, and the bodies of the dead and wounded. • On August 23, 1914, Colebourn boarded a troop train that would take him from Winnipeg to a military staging area in Valcartier, Quebec. From there, Canadian servicemen would be sent overseas. • The following day Colebourn's train stopped in White River, Ontario, a small town between Port Arthur (later Thunder Bay) and Sault Ste. Marie. • At the train station he met a hunter with an orphaned female bear cub. The hunter had shot and killed the cub's mother, without whom the cub was almost certain to die. • Colebourn offered the hunter $20 (about $350 in 2004 dollars) for the cub. The hunter gladly made the trade. • Colebourn commemorated his adopted home town by naming the cub "Winnipeg Bear." Her name quickly became "Winnie" for short. • Winnie accompanied Colebourn on the train and stayed with him in the encampment at Valcartier. She was on Colebourn's troopship when it set sail for England on Oct. 3, 1914. • In England, the Canadians lived in an encampment and training ground on the Salisbury Plain. 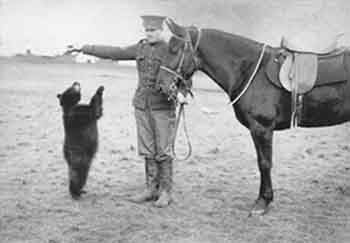 The soldiers played with Winnie in their off hours. 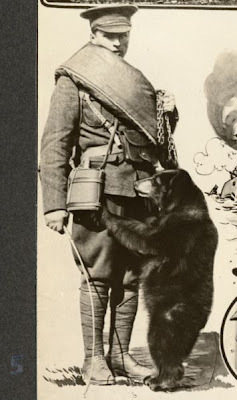 in spite of all common sense warnings from his fellow soldiers, takes her with him to the camp in Valcartier, Quebec where the Canadian expeditionary force is gathering. Winnie is a breath of fresh air for the young soldiers faced with the prospect of war, and she travels with them all the way to Salisbury Plain in England. • In December 1914 Colebourn's unit, the 2nd Canadian Infantry Brigade, got word they were about to leave for the war zone in France.. When Harry’s regiment is sent to fight in France, the young vet knows Winnie cannot go. He finds a home for her at the London Zoo, promising to return as soon as the war is over and take her back to Canada. While Harry and his friends fight in France, Winnie becomes the star attraction at the zoo. For the children of London, living in the shadow of a frightening war, she becomes a symbol of friendship and hope. • The zoo, located in the city's Regent Park, was the home of the Royal Zoological Society of London. It had a habitat for bears called the Mappin Terraces. • Harry Colebourn's donation to the zoo was intended to be temporary. He visited Winnie every time he was on leave in London. • By the end of the war in 1918, Winnie had many admirers and was one of the zoo's most popular animals. Colebourn decided to leave her in the zoo's care and, in a ceremony on December 1, 1919, he officially handed her over to the zoo. • Winnie was so tame that parents would place their children on her back for a ride. • Another favorite activity for children was to feed Winnie a mixture of condensed milk and corn syrup. • Two of Winnie's frequent visitors in the 1920s were a young boy named Christopher Robin and his father, writer A.A. Milne. • Christopher Robin had a teddy bear, originally called Edward, that he renamed Winnie-the-Pooh. 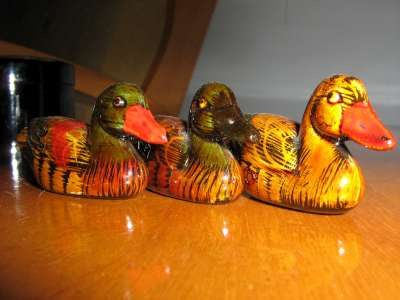 "Winnie" came from the bear in the zoo, and "Pooh" was apparently drawn from a pet swan of the Milnes' acquaintance. • A.A. Milne wrote for the humour magazine Punch. He also wrote a detective novel and many plays, essays and short stories. 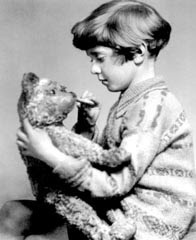 Christopher Robin Milne with Pooh. • In 1926 Milne published a book called Winnie-the-Pooh. It was illustrated by a friend and fellow Punch contributor, Ernest H. Shepard. • Milne's The House at Pooh Corner followed in 1928. He also produced two classics of children's verse: When We Were Very Young in 1924 and Now We Are Six in 1927. 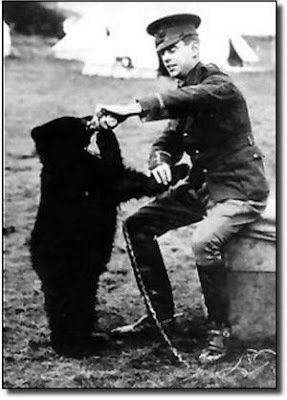 • Winnie lived at the zoo until 1934. In the last two years of her life she had cataracts and arthritis and suffered a stroke that partly paralyzed her. She was euthanized on May 12, 1934. Winnipeg continues to celebrate its unique relationship with the exuberant Winnie-the-Pooh. 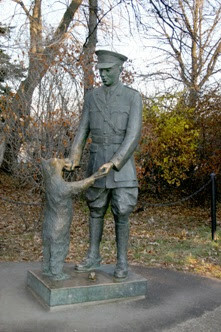 In the city's Assiniboine Park you will find two special Winnie tributes: a bronze statue of Captain Colebourn and Winnie, and an original oil portrait of Winnie-the-Pooh by the illustrator Ernest H. Shepard - forever linking Winnie-the-Pooh to the city which gave him its name. The story of the bear that inspired a timeless classic. Tells the true story of Lt. Harry Colebourne, who rescued an orphaned black bear cub and donated her to the London Zoo, where she eventually became the inspiration for Milne’s books.In 1914 Lt. Colebourne, played by Michael Fassbinder (/Band of Brothers/), is on his way to WWI battlegrounds when he and other soldiers of the 34th Fort Garry Horse Division stop at a train station in White River, Ontario. When a startled horse starts trampling the market outside the train station, we get the first clue that Colebourne is extraordinarily good with animals as he calms the half-ton animal. The next creature he finds is a crying bear cub, not nearly as big butclearly in distress. The cub has been orphaned by a hunter, and Colbourne, a trained veterinarian, knows she is too young to survive on her own. So, he buys the cub for $20.Back on the train, the small bear meets with disapproval from the conductor and Colonel John Barret, played by Gil Bellows (/The Shawshank Redemption/ and/ The Practice/). That sets up the conflict for greater part of the movie. Colebourne and the men want to keep the cub. 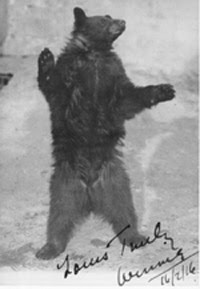 Despite the official rules they name her after their hometown Winnepeg and claim her as their mascot.Once they reach their staging area in eastern Quebec, Col. Barret insists that the bear be removed from camp and returned to the wild, but Gen. Hallholland, played by David Suchet (best known as Hercule Poirot), thinks a mascot is good for moral. The film, made for Canadian television, looks fantastic on the big screen and the score adds just the right touch of humor and whimsy. When the war becomes more present the music reflects the less joyful mood without becoming heavy. The period costumes and sets lend authenticity and the actors bring an innocent sensibility to their portrayals which feels right for 1914. The only technical flaw is the repeated use of slow-motion in the close shots of the bear cub. These were almost certainly used to compensate for the difficulty of keeping even a trained bear cub relatively still--in the camera frame and in focus--long enough for a decent shot. It’s a minor point and is easily overlooked. The film is skillfully directed by John Kent Harrison. 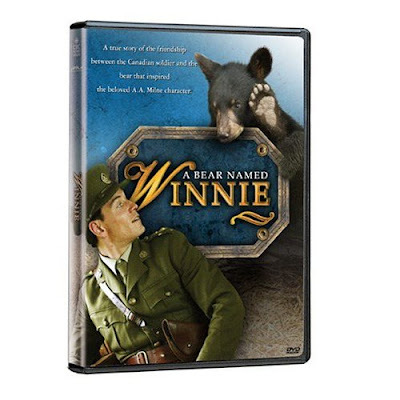 His previous credits include numerous TV movies, including /A Wrinkle in Time /and/ Helen of Troy/.A BEAR NAMED WINNIE is a Crystal Heart Award winner from the 2005 Heartland Film Festival and will be available on DVD in November, 2005. "I got up close and personal with Bonkers, the 600 pound adult bear who played the grown-up Winnie, on my first day. 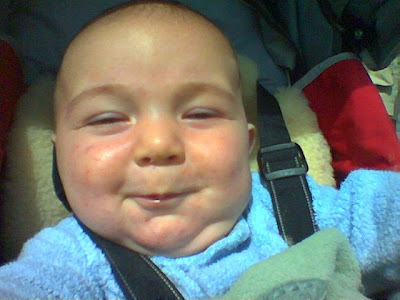 He sniffed both sides of me and apparently I passed his test." it’s history of tragedies ..
two tragedies happened at night in this day ..
they both hold , death , fear , dark and sad memories .. The British luxury passenger liner Titanic sank on April 14-15, 1912, en route to New York City from Southampton, Eng., during its maiden voyage. 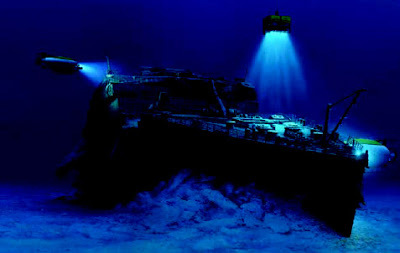 The vessel sank with a loss of about 1,500 lives at a point about 400 miles (640 km) south of Newfoundland. 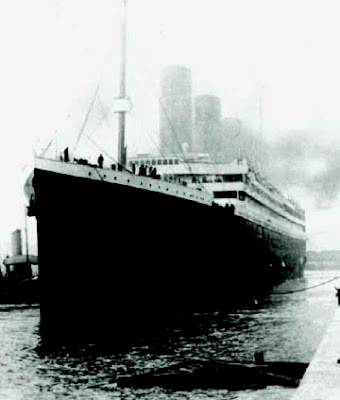 The Titanic was launched on May 31, 1911 at the specially built Harland and Wolff Shipyard in Belfast Ireland. She and her older sister, Olympic were the largest ships in the world when they were built and were considered to be high tech in their time. A third ship, the Britannic, was finished after the Titanic. The White Star line built the ships to compete with Cunard line's Lusitania and Maritania. They were able to carry 3,550 people including the crew in elegant style. Every shipwreck tells a story of tragedy and human loss. The loss goes beyond the lives of those who perished in the sinking, beyond even all those ashore, the friends and family whose lives were shattered. Some shipwrecks are so significant, so meaningful at a symbolic level, their loss can stab deep into the psyche of a nation, of an entire society. The sinking of Titanic is one such shipwreck. The story of Titanic’s short life and tragic death has enthralled generations since that fateful night in April, 1912, when more than 1,500 people died in the freezing waters of the North Atlantic, on a moonless night under a sky glorious with stars. Although that number has been vastly eclipsed by other catastrophes, the tragedy of Titanic has endured to pull at the heartstrings of people all over the world. The great ship, at that time the largest and most luxurious afloat, was designed and built by William Pirrie's Belfast firm Harland and Wolff to service the highly competitive Atlantic Ferry route. It had a double-bottomed hull that was divided into 16 presumably watertight compartments. Because four of these could be flooded without endangering the liner's buoyancy, it was considered unsinkable.Shortly before midnight on April 14, the ship collided with an iceberg; five of its watertight compartments were ruptured, causing the ship to sink at 2:20 AM April 15. 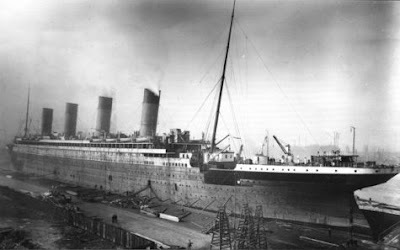 Inquiries held in the United States and Great Britain alleged that the Leyland liner Californian, which was less than 20 miles (32 km) away all night, could have aided the stricken vessel had its radio operator been on duty and thereby received the Titanic's distress signals. 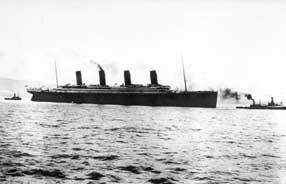 Only the arrival of the Cunard liner Carpathia 1 hour and 20 minutes after the Titanic went down prevented further loss of life in the icy waters. The 45,000 ton Titanic was 882 1/2 feet (269 meters) long , 92 1/2 feet (28 meters) wide and about 10 stories tall, more with the smoke stacks. She had 24 boilers to power her reciprocating steam engines and turbines which pushed her through the water at as much as 24 knots (27 1/2 miles per hour.) Passengers had their choice of accommodations, ranging from clean but crowded third class to luxurious first class. The small third class cabins had bunk beds enough for a family with room for some luggage under the lower bunks and a sink. First class staterooms were quite large and were decorated with carved paneling and wall paper. First class passengers had comfortable beds, bureaus, tables and chairs couches as well as a sink. First class passengers could choose to have their meals at the first class dining room, at the a la carte (Ritz) restaurant or at the Cafe Parisien. They also had a gym with exercise equipment, a smoking room, Turkish baths, a swimming pool and a lounge. After sea trials, the Titanic loaded passengers at South Hampton England. At noon, Wednesday, April 10, 1912, the Titanic, with Captain Edward Smith in command, let go her mooring lines and maneuvered toward the open sea. As she approached two smaller liners tied to a pier, the mooring lines on one, the New York, snapped and the ship drifted into the path of the departing super-liner. Quick work narrowly avoided a collision. One passenger was overheard saying the near collision was a bad omen. 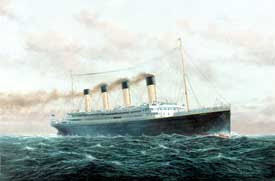 The Titanic stopped at Cherbourg, France and Queenstown Ireland to pickup more passengers. In Queenstown she anchored because there was no dock big enough for the ship; passengers were ferried to the ship by White Star Line boats. She departed in the afternoon Thursday on her maiden voyage to New York. The passengers enjoyed a pleasant journey with fine weather and calm seas. The crew was happy with the performance of the ship's machinery and was expecting to beat the Olympics speed to New York on her maiden voyage. April 15, 12:25 amThe ship was sinking fast. 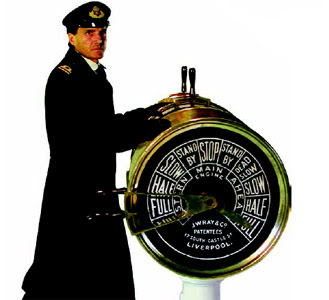 Captain Smith gave the order to load the lifeboats. Unfortunately, there were only enough lifeboats to carry 1,178 of the more than 2,200 people on board.April 15, 2:20 amTitanic, still holding hundreds of people, sank beneath the waves. In all, 700 people were rescued, and more than 1,500 died. After years of construction and work, the Titanic was finally ready for her maiden voyage. The beginning of her voyage was to take place on the morning of April 10, of 1912 at approximately 10:00am. The firs of Titanic passengers began to board the ship. Most of these passengers were British residents who had journeyed to Titanic by means of transportation either that a boat train. The real precipitance came when the boat train arrived. People rich or poor were scattered all aver Southampton’s bay, attempting to find their gangway. After the second and third class passengers boarded, the firs class passengers were to be escorted to their cabins. Approximately at 12:00pm Titanic was ready to set sail. After Titanic sets out into the open sea, her water displacement causes mooring ropes of the New York, which was a small ship, to brake. Which causes her stern to swing towards Titanic's mighty bow. Titanic official’s quick actions prevent a catastrophic collision. After hours delayed the Titanic finally sets sail into the open sea headed towards Cherbourg, France. 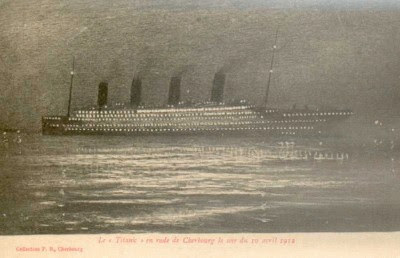 The Titanic lowered her anchor when arrived at Cherbourg, France, at about 5:30pm of the same day. More passengers boarded the Titanic. 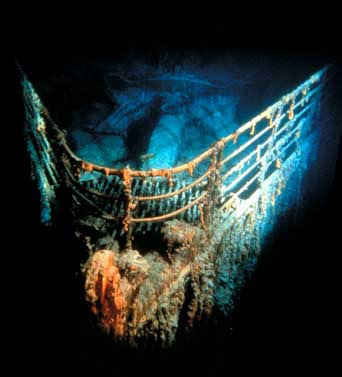 At approximately 8:10pm Titanic On Sept. 1, 1985, the wreck of the Titanic was found lying upright in two pieces on the ocean floor at a depth of about 4,000 m (about 13,000 feet). The ship, located at about 41° 46' N 50° 14' W, was subsequently explored several times by manned and unmanned submersibles under the direction of American and French scientists. The expeditions found no sign of the long gash previously thought to have been ripped in the ship's hull by the iceberg. The scientists posited instead that the collision's impact had produced a series of thin gashes as well as brittle fracturing and separation of seams in the adjacent hull plates, thus allowing water to flood in and sink the ship. In subsequent years marine salvagers raised small artifacts and even a 20-ton piece of the hull from the wreckage. on April 15, 1986, Reagan ordered major bombing raids against Tripoli and Benghazi that killed 60 people Among the victims of the 14 April attack was the adapted daughter of the Libyan leader. Without any declaration of war, the United States launches air strikes against Libya in retaliation for the Libyan sponsorship of terrorism against US troops and citizens. 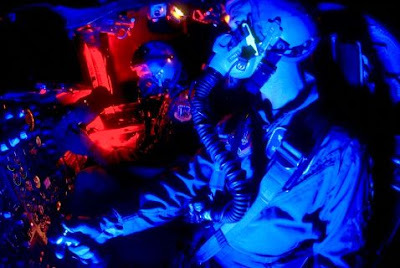 The raid, which began shortly before 02:00 (Libya time = 00:00 UT), involved more than 100 US Air Force and Navy aircraft, and was over within an hour. 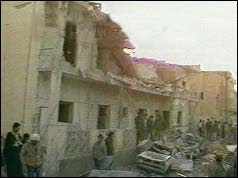 Five military targets, including the home tent of Libyan leader . 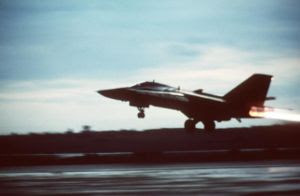 The attacks were mounted by 14 A-6E navy attack jets based in the Mediterranean and 18 FB-111 bombers from bases in England. 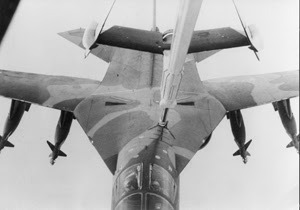 Numerous other support aircraft were also involved. 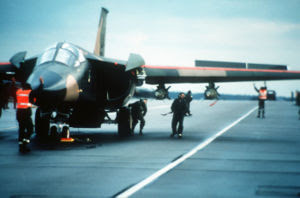 France refused to allow the F-111s to fly over French territory, which added 2600 total nautical miles to the journey from England and back. Three military barracks were hit, along with the military facilities at Tripoli's main airport and the Benina air base southeast of Benghazi.. 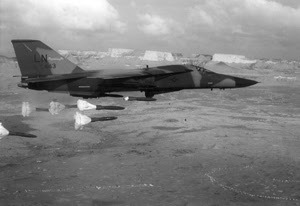 The Benina military airfield was hit to preempt Libyan interceptors from taking off and attacking the incoming US bombers. I was too young to remember that day. But they all said they were afraid and shocked, and it was a sad, dark long night on the Libyan sky. '"It is a dialogue between nature and the man-made,"
Officially opened December 14, 2004. 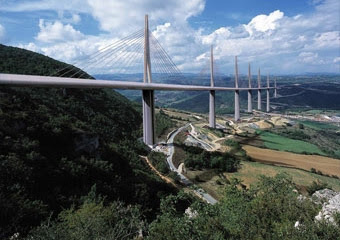 '"The Millau Viaduct is a magnificent example, in the long and great French tradition, of audacious works of art, a tradition begun at the turn of the 19th and 20th centuries by the great Gustave Eiffel," [President of France Jacques Chirac] hold a reception. 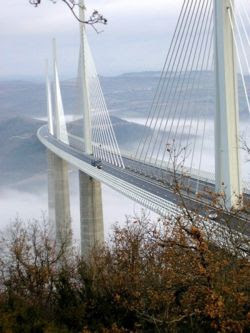 Millau's most famous feature is its new bridge. Information about the rest of Millau will follow, but here is some information about the bridge. This bridge is the world's highest road bridge. It spans the valley of the River Tarn, a 2.5 km wide gorge dividing two plateaux in France's rugged Massif Central. Part of the motorway from Paris to Barcelona, it enables motorists to drive through the sky, often above the clouds. The bridge crosses the Tarn valley at its lowest point, linking the causse du Larzac to the causse rouge. The bridge is within the perimeter of the Grands Causses regional natural park. 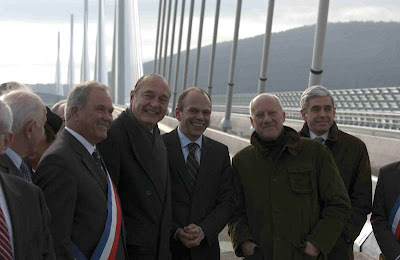 The bridge is the last link on the A75 autoroute, providing a continuous high-speed route from Paris through Clermont-Ferrand to Béziers. Many tourists heading to southern France and Spain follow this route because it is direct and mostly toll free. The A75 (la Méridienne) is a developmental project which will speed up and reduce the cost of car travel from Paris southwards, and it is free for the 340 km between Clermont-Ferrand and Béziers. Built in steel-and-concrete the bridge is more than 300m (984ft) high - taller than the Eiffel Tower. It floats 270 meters (891 feet) above the Tarn valley for a 2.5 kilometers (1.6 miles), its concrete and steel pillars soaring high above the morning fog. The bridge has the optimum span between cable-stayed columns. It is delicate, transparent, and uses the minimum material. Each of its sections spans 350 meters. 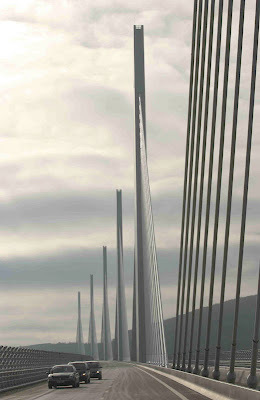 The columns range in height from 75 meters to 235 meters - with the masts rising a further 90 meters above the road deck. To accommodate the expansion and contraction of the concrete deck, each column splits into two thinner, more flexible columns below the roadway, forming an A-frame above deck level. This structure creates a dramatic silhouette. Built in three years at a cost of €394 million (£272 million), the bridge is not merely a gateway to the Riviera floating over what had been one of the nation's most notorious bottlenecks, but as an embodiment of Gallic flair, a stylish marriage of the functional and the aesthetic. President Jacques Chirac, who inaugurated it said: "It is a magnificent example, in the long and great French tradition, of audacious works of art, a tradition begun at the turn of the 19th and 20th centuries by the great Gustave Eiffel. "The French people are rightly proud of the feats accomplished here - feats which speak for France. A modern France, an enterprising, successful France, a France which invests in its future." The project was financed privately by the French construction group Eiffage - the same group that built the Eiffel Tower. They financed the project in return for the right to collect receipts from a bridge toll for 75 years. The French government has the right to assume control of the bridge from 2044, if it proves extremely profitable. An estimated 10,000 vehicles use it every day, rising to 25,000 per day at the height of summer. Toll fees for motorists when it opened were 4.90 euros ($6.50) in winter and 6.50 euros ($8.62) in summer. Lorries (US trucks) pay 24.30 euros ($32.24) year-round. Impossible n’est pas francais ! It means : Impossible is not a French word !